first-year athletes step up and fill in key roles, and we had our veteran athletes continue to improve upon their previous times. draw attention away from the boys’ impressive dual/tri/quad record of their own. They extended the undefeated streak that started in 2009 into the 2012 season by beating Tuscola and Teutopolis in our opening meet, and they finished the season with a respectable record of 12-4. Lastly, the team finished with a record 100 individual medals. The Sullivan-Okaw Valley cross country teams competed at the regional in Carlinville’s Loveless Park on Saturday. The boys finished 6th, which qualifies both teams to compete in the sectional meet. This was the boys’ fourth consecutive sectional-qualifying team. The boys were led by Ethan Lehman, who set a PR with a time of 16:28. Clayton Waldhoff was 2nd for the Redskins followed closely by Cody Carman. Ryan Johnson and Alex Harvey ran 17:38 and 17:42 while Hunter Marshall and Nick Cravatta finished out the Redskins’ team. Lehman ran a great race for the boys. He shaved about 20 seconds off his previous best time. Waldhoff has been peaking at the right time, and Carman ran like he is capable of as well. Johnson has been battling knee problems for pretty much his entire career, but they have been hurting more lately. We actually sat his out of the last meet to give him some time to recuperate. About a half-mile into the race, it was apparent that his knees were bothering him. He stuck it out and finished the race, followed closely by Harvey with his best performance of the year. Not only did Cameron Harvey qualify for the Class 1A State Cross Country meet for the 3rd consecutive year, but he was also able to earn back to back all-state honors. Cameron completed the 3-mile course at Detweiler Park in Peoria in 15:25, earning 21st place. 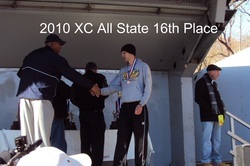 Harvey is the first runner from Sullivan to be a 2-time member of the 25-person all-state team ever. At Monticello's Lodge Park, the Sullivan-Okaw Valley boys cross country team advanced to the sectional meet for the third straight year. Team members include Cameron Harvey, Bill Brown, Micah Plank, Cody Carman, Ryan Johnson, Kent Hanson, and Walker Herzog. The Class 1A sectional race will be held at Hickory Point Golf Course in Decatur on Saturday, October 29th and will feature 7 of the top 15 teams in the state. 10-4-11 SOV Boys undefeated streak extends from 2009 though 2011. In a tight race, Sullivan-Okaw Valley edged Shelbyville by 3 points to remain undefeated for a second straight year and more in dual, triangular, and quadrangular meets. Coming throught the first mile in about 5 and a half minutes were Cameron Harvey, Bill Brown, and Micah Plank, along with 5 Shelbyville runners. It was extremely close at the two-mile mark with little separation between the leaders. Harvey finished first easily, and Bill Brown beat out Shelbyville's top runner by a step for 2nd place. Micah Plank finished 5th overall, while Cody Carman, Ryan Johnson, and Walker Herzog all had good races for the Redskins. Cameron Harvey is the 16th fastest Class 1A runner in the state of Illinois. In the State Cross Country meet at Detweiler Park in Peoria, Harvey finished the 3-mile course in 15:17, earning all state honors with his 16th place finish. With a victory over Shelbyville, Arthur, and Tuscola, the Sullivan-Okaw Valley boys cross country team finished perfect in dual, triangular, and quadrangular meets this year. Their undefeated streak continues since the end of the 2009 season. Congratulations SOV boys! The SOV boys cross country team won their first team individual in at least a decade on Saturday, September 10th. The Shelbyville Trail Invitational Champions were led by Cameron Harvey, who was the individual winner and set a course record. The top seven runners included Harvey, Matt Garrelts, Micah Plank, Walker Herzog, Kent Hanson, Bill Brown, and Cody Carman.